Wearable devices will see 15.9 percent growth this year on their way to selling 132.9 million units, according to a new forecast from International Data Corp. (IDC). Throughout the forecast, the market will see a compound annual growth rate (CAGR) of 13.4 percent, reaching 219.4 million shipments in 2022. "Consumers are finally starting to understand and demand the utility of a smartwatch," said Jitesh Ubrani senior research analyst for mobile device trackers at IDC, in a prepared statement. "At present, fitness uses lead by a mile but mobile payments and messaging are starting to catch on. 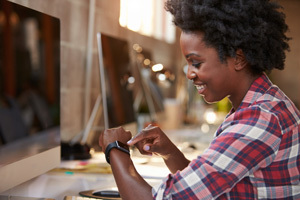 The addition of cellular connectivity is also starting to resonate with early adopters and looking ahead the emergence of new use cases like music streaming or additional health sensors will make cellular connectivity pivotal to the success of the smartwatch." Basic wristbands will lead the market this year, with a 35.9 percent share of the market and 47.7 million shipments. The category will also see the lowest growth rate throughout the forecast period, however, at just 0.3 percent, to finish with 48.2 million shipments and a market share of 22 percent in 2022. Smartwatches will see 43.6 million sales this year for a share of 32.8 percent. Throughout the forecast, the category is predicted to experience a CAGR of 17.9 percent to grow to 84.1 million sales in 2022, though market share for the category will decline slightly to 38.3 percent. "Over half of all smartwatches in 2017 were shipped by Apple, and while the company will maintain its lead in this category, competing products from the likes of Fitbit, Garmin and all the Wear OS (previously Android Wear) vendors will gain traction over time," according to an IDC news release. "Another growing sub-segment within this category are smartwatches dedicated to kids, though these will largely be relegated to China. Smartwatches are also expected to have the highest average selling price and are forecast to account for more than two-thirds of the dollar-value of the entire wearables market." Basic watches will experience a CAGR of 16.4 percent, as shipments grow from 32.4 million this year to 59.4 million the year the forecast ends, but the category's market share will see a more modest growth, improving from 24.4 percent this year to 27.1 percent in 2022. Basic watches "face challenges as vendors have struggled to educate users around the benefits of these devices," according to IDC. 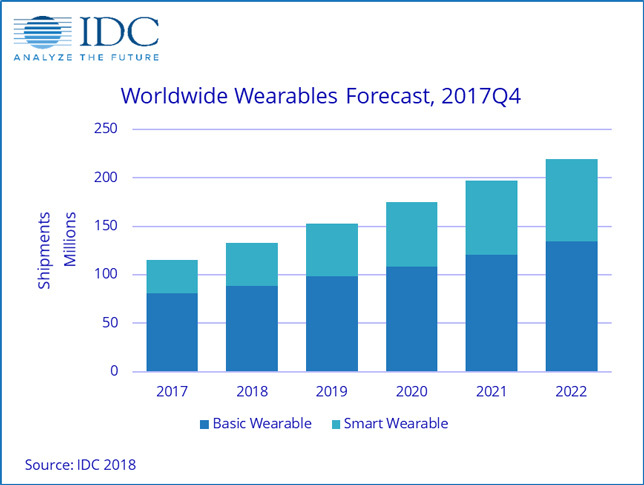 "Many consumers still view these devices as timepieces rather than as wearables that are part of a larger ecosystem and as a result IDC expects this category to remain secondary to their smarter counterparts." Earwear will see the fastest growth throughout the forecast, with a CAGR of 48 percent, though it's starting out with a meager 2.8 million shipments this year and a market share of just 2.1 percent. By 2022 those numbers are projected to be 13.3 million and 6 percent, respectively. "With the rise of smart voice-enabled assistants, hardware developments from chip makers like Qualcomm, and the growing popularity of wireless headphones, IDC anticipates this form factor to be the most popular outside of wristbands and watches," according to a news release. Clothing will come in second in terms of CAGR at an even 30 percent, though it also comes in next to last among the five major categories in terms of 2018 shipments with 4.1 million projected and a 2018 market share of 3.1 percent. In 2022 that growth will lend the category 11.6 million shipments and an improved market share of 5.3 percent. "To date," according to IDC, "this category has been driven by step-counting shoes from the likes of Li-Ning or Under Armour that mostly cater to average consumers. However, going forward, IDC anticipates other niche brands to start gaining traction as they target professional athletes or enterprise workers in hazardous environments." All other devices, as a category, will see a modest growth in number of devices sold, impriving from 2.4 million units this year to 2.8 million sales in 2022, but will see their market share decline from 1.8 percent to 1.3 percent over the same period. "The others category, devised of lesser known wearables, such as those that can be clipped to different parts of the body or head-worn devices like the Muse headband, or even smart wristbands (ones that can run third-party apps), is expected to maintain a very small portion of the overall market," according to information released by IDC. "The non-standard form factors will make these devices a tough sell to the mass market, but their ability to cater to very specific needs may make them a somewhat lucrative business."